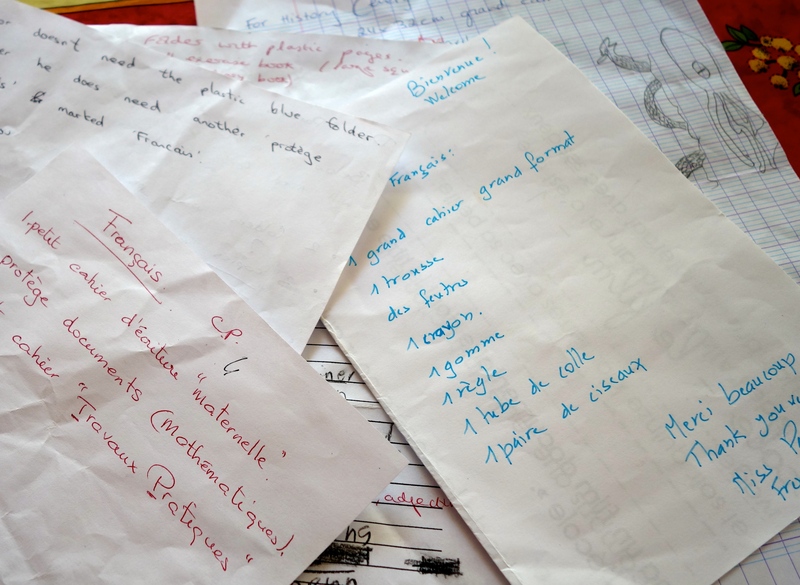 There were a lot of things I was hoping to do during the kids’ first week at school in France. Long, pointless walks, lingering lunches, afternoon naps, hours of reading.. I did not expect to spend a week buying stationery. Back in New Zealand you pay the school office some money and someone delivers a box of stationery to your child’s class. Sure enough, on their first day, the two boys at junior school were each given a short list. This was not the familiar domain of stationery standards like the good old 1B5 in New Zealand. The teachers here provide more of a description and you get to interpret it. Our first hiccup was that every stationery book had squares instead of lines. Finally we worked out that there are no lined books in schools. Everything is squares, small or large. This helps them keep their writing neat, I believe. Eventually, we ticked off the lists and triumphantly arrived at school to pick up the kids. “I need more stationery,” said Small, handing over a list. “Me too,” said Medium. So it went on, day after day. Up and down the stationery aisle like the walking dead, we roamed, resorting to interrogating a six-year-old on one occasion – her mother was surprisingly relaxed about her daughter giving stationery advice to gormless heavily accented zombies. But all this time stuck in an artificially lit, soulless box when the sunny South of France is outside calling “Coucou! Rosé anyone? Lunch?” It was cruel. By the end of the week the sight of the supermarket was making even the kids feel sick – and they’d only been once. We decided as one that the family would not be going anywhere near a supermarket on the weekend. The job would have to wait until next week. Postscript. A week later, we ducked into a nondescript bookshop in central Aix en Provence whose entrance was obscured by tacky postcards and calendars. Inside lay a joyful discovery. This long, narrow shop is packed wall-to-wall with seriously good books, staffed by people who know and love books – and there is even an English section downstairs. Most heartening of all: upstairs in a neat little alcove is a small but perfectly adequate stationery section where nothing is too much for the assistant who works there. Next time we get a stationery list, we’re heading for the bookshop. ← There’s a “p” in my soupe?